It currently supports a wide variety of AVR chips, including the 28-pin ATmega48/88/168/328 series, the 20-pin ATtiny2313, and many 8-pin ATtiny devices (such as the ATtiny25/45/85 and ATtiny13A). 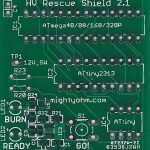 A list of supported devices is in progress, but the Rescue Shield supports many more devices than those listed on the wiki. Update Feb 2011: Version 2.1 is in stock and shipping now! Support for many common families of AVR microcontrollers in DIP packages. Works with the original Arduino (NG, Duemilanove, Uno) and the Arduino Mega. 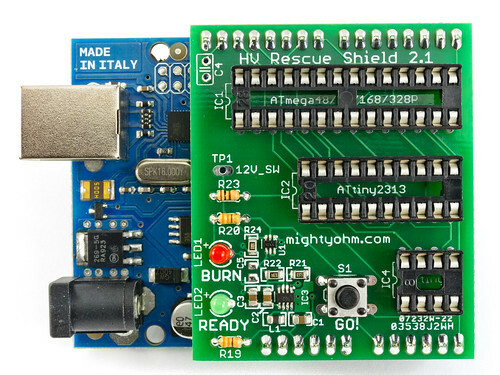 Support for 8-pin ATtiny devices that use High Voltage Serial Programming (HVSP) mode! Mode selection at startup so you don’t have to recompile the Arduino sketch to change parts. More reliable HFUSE burning on all HVPP targets. Numerous minor bug fixes and speed improvements to the code. 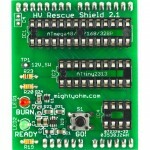 The HV Rescue Shield is not a general purpose AVR microcontroller programmer. That is, it can’t be used to perform a chip erase or program flash memory. It is intended only for programming the AVR’s configuration fuses: HFUSE, LFUSE, and EFUSE (where applicable). The hardware implements all of the control lines to support flash programming, but the code just isn’t there. If anyone would like to volunteer to rewrite the code to support more features, such as general flash programming, please post in the support forum! To purchase kits or bare PCBs, use the links below. See the Shipping Status page for information about current stock and delivery. 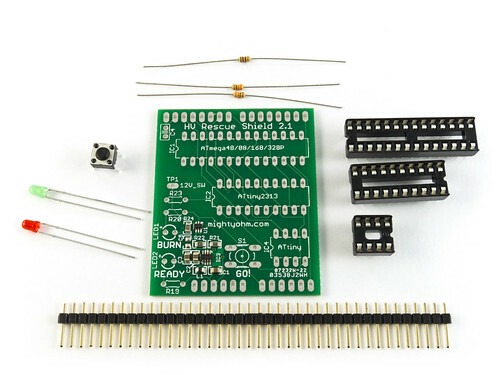 Includes a high quality PCB with pre-assembled DC-DC converter and all components required to build the kit. Note: Arduino and target AVR not included. Get a head start in building your own programmer from scratch! Note: DC-DC Converter is not included. Components not included. US Customers: Orders are shipped USPS Priority Mail. Allow 1-2 weeks for order processing and delivery. International customers: Orders are shipped via USPS Priority Mail International and can take 4-6 weeks including customs clearance delays (typically less). VAT taxes, duties, import tariffs, customs fees, etc. are the responsibility of the buyer! To review the contents of your shopping cart, click the View Cart button below.